WGA Strike on Flickr - Photo Sharing! Shane did a great new interview with Tonight Show Head Writer Joe Medeiros today. I think he does a great job of covering some new ground in this nearly two week old strike and Shane’s production chops are improving, too. It’s about five minutes long. The WGA just announced that Democratic presidential candidate John Edwards will join striking writers on the poicket line Friday. ” Following his public statement of solidarity with the Writers Guild of America last week, former U.S. 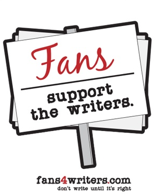 Senator John Edwards will join striking writers on the picket line tomorrow to support the WGA in its ongoing fight to secure a fair and reasonable deal.” He will join the picket line at 2 PM at NBC Entertainment, 3000 W. Alameda Avenue in Burbank at the NBC sign on the corner. This absolutely one-ups all previous political activity on the line where Barack Obama’s LA staff and volunteers joined the strikers but not the candidate himself.